Time is money. The academic profession, like so many of the liberal professions, has always had an uneasy relation to Benjamin Franklin’s adage. We don’t easily see ourselves as waged workers. Though we recognize the necessity of completing labourious tasks (e.g., grading assignments, writing grant applications, sitting on administrative committees), for many these are part of the Faustian compact allowing us to pursue our own freely chosen interests. The purpose of this brief essay is to use my recent experience at the Banff Centre for the Arts to critique the relation between time and money in the production of that thing we call an “academic career.” As I hope to show, time has a very precise articulation in today’s academic industry, where the infiltration of managerial logic into the university administration has encouraged a short-term, self-interested disposition among its faculty employees. Here the illusion of free time confronts the fact that success in the business depends on effective, self-governed, time management. A failure, or refusal, to work under these conditions has material consequences for individuals, a fact that poses a great challenge to those opposed to the neoliberalisation of the university. In what follows, I explore the possibilities offered by taking refuge, a tactical withdrawal that I would call wasting time. Before travelling to Banff specifically, I think it is useful to rehearse some of the standard arguments about academic labour. Any such effort must begin by acknowledging the function of social capital. The rewards of academic life are not paid in mere wages; or, to put it more bluntly, you’re not getting rich anytime soon with your theory on what caused the War of Jenkins’ Ear. While tenured professors will likely live and retire in comfort, their salaries in the main do not compare favourably with those in the legal or medical professions. Indeed, I happen to work at the University of Alberta, located in the city of Edmonton, which is also the gateway to Canada’s massive and infamous tar sands, a place where an unskilled labourer can make upwards of $130,000 a year. As an Assistant Professor, I make just over half that. And, of course, among my peers, I’m relatively lucky: I have a tenure-track job. My point here is not to complain that I’m underpaid (I’d rather suggest that others are overpaid), but only to point out that academia is not the most direct path to material wealth. Leftish thought would suggest that we could work to fix these things if we would first organize. However, academics seem married to the mythology of independence, and this desire suggests we think of the tenured or tenure-track faculty member as belonging to a liberal profession. As historians like Penelope Corfield (1995) and Harold Perkin (1989) have shown, this is a category that coincides with the rise of commercial capitalism and the consequent revolution in social organization. The liberal professions emerge to solve the problem caused by the fact that not every aspiring gentleman can be a capitalist. At its base, a liberal profession offers a “respectable” route to social status and income. As Corfield describes it, professional work is “dignified and not menial. It [is] untainted since it [does] not deal directly in “filthy lucre” or entail toiling at dirty manual labour.” Above all, though, a profession offers individual liberty, the “freedom from close daily supervision” (Corfield 174). Of course, anyone who has read a bit of Durkheim, Foucault, or Deleuze knows that close daily supervision is just one of the cruder options available to those who would discipline a subject. Professions merely substitute supervision for techniques of self-regulation. Traditionally, this has taken the form of a professional ethic, through which dispersed individuals can imaginatively, positively, and sympathetically identify with each other. We submit ourselves, in other words, to the judgment of our peers. We pride ourselves, at my institution and at many others, for retaining the professional privilege of self-regulation: cases for tenure, merit-based salary increases, and promotion are all determined by a committee of fellow academics. To be an academic, or what a grudge-holding Schopenhauer called a book-philosopher, is to be a hustler or, depending on your ideological preference, an entrepreneur in the marketplace of ideas. Today the length of one’s CV supersedes the metric of bums-in-seats, as individual academics work enterprisingly at building their career. We publish, we network, and we collaborate. Perhaps it has always been so, but more recently these forms of academic activity are inflected by the incorporation of the university system within the global economy. Our peregrinations, whether as the itinerant adjunct scrambling between cities to find enough contract teaching to pay the bills, or as the renowned professor moving from one endowed chair to another, have accelerated. Concurrently, the same forces of neoliberal globalization that hollowed out the manufacturing and industrial core of developed nations have turned their universities into economic engines. With market-minded governments announcing an educated population as the new competitive advantage in the postindustrial landscape, universities have received enormous increases in private and public funding. According to the United States’ National Center for Education Statistics, enrollment in degree-granting postsecondary institutions increased by 9 percent between 1989 and 1999. However, between 1999 and 2009, enrollment increased 38 percent, from 14.8 million to 20.4 million. New buildings, new programs, and new forms of training have been produced in response to governments’ decrees that education is vital to a nation’s economic security. But as universities became more and more dependent upon funding from government bodies, the academic profession also lost some portion of its sovereignty. The new obligation to present the university as a useful state institution has called forth a new intermediary class, a phalanx of Louis Bonapartes’ to represent us who seemingly cannot represent ourselves to the State: the administrator. In his recent book, The Fall of the Faculty (2011), Benjamin Ginsberg has surveyed the rise of the career administrators, the deanlets and the deanlings who introduced into the political life of a university a managerial logic that has transformed the way things are done on campuses. Critics like Ginsberg speak angrily in such terms about the corporatization of the university. A familiar refrain in this rhetoric is the complaint that, collectively, we work under pressure to produce a regular accounting of the work we do, in terms that are meaningful not to our peers but to our shareholders (the public as mediated through elected officials and senior civil servants) and, to a lesser extent, our consumers (our students). I wonder, however, whether this pessimism is necessary. Perhaps it is a mistake to think that our options are limited to submission and protest. As Gilles Deleuze explained in his précis of our transition from disciplinary societies to societies of control, there is no sense complaining which regime we operate under. The fact is that there is always a regime. In each of them, we find “liberating and enslaving forces confront[ing] each other” (4). As such, when we recognize a regime change, Deleuze counsels, there “is no need to fear or hope, but only to look for new weapons” (4). It is in this Deleuzian spirit that I want to think about our transition from a liberal to a neoliberal profession, and offer the following thoughts on how we can spend our time. This year’s inaugural Banff Research in Culture (BRiC) program took as its theme the idea of “the Commons.” Immediately, then, one can see how it might set out to resist or at least protest against the emerging neoliberal hegemony. After all, neoliberalism’s ideology fundamentally opposes groupings, organizations, or any social unit larger than the individual actor. Pierre Bourdieu explains how its pursuit of a pure and free market necessarily entails “a programme of the methodical destruction of collectives.” By assembling graduate students, postdocs, pre-tenure faculty, social activists, writers, curators, and artists together for three weeks, BRiC testified to an ongoing, international, interdisciplinary interest in exploring alternatives to a disaggregated individuated world market. And yet, there is also something almost too predictable about these kinds of assemblies. 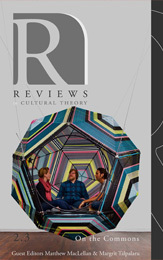 The original idea for BRiC belongs to people working in the field of cultural studies. The call for applications as written by seminar organizers Imre Szeman and Heather Zwicker appears universal in its invitation but broadcasts only along certain established academic and artistic networks. Moreover, the tone of the call made its politics unmistakable, announcing our collective entry into a moment of crisis. As an increasingly rapacious capitalism draws ever more elements of social life into its profit logic and renders seemingly every activity and value into a commodity, thinking with and through the commons has become an important means of generating conceptual and political resistance to the multiple new forms of enclosure that continue to take place today, and which need to be confronted and challenged forcefully and directly. How might we shape new collectivities and communities? What are the capacities and dispositions essential to producing new ways of being? What lessons can we learn from history as well as contemporary struggles over the commons (from challenges to intellectual property to indigenous struggles)? What concepts and vocabularies might we develop to aid our critical and conceptual work with respect to the commons (e.g., Alain Badiou’s revival of communism or Jacque Rancière’s reconfiguration of equality and democracy)? How does artistic and cultural production participate in the production of new collectivities and defense of the commons? These kinds of questions are attractive only, as my mother would say, to a certain type. The result was a dispositional coherence among its otherwise diverse attendees. In other words, no disciples of Chicago School economics—nor, for that matter, any economists—were in attendance. My point here is not to put unreasonable demands upon one three-week residency program, nor is it either to dismiss the value of, as the BRiC thematic subtitle suggests, “Believing-Acting-Feeling-Together.” Rather, I want to argue that what actually might have been achieved in this gathering differs greatly from its superficially stated intentions. To explain this, it is first important to recall the setting of BRiC, in the Banff Centre for the Arts, a compound nestled halfway up a mountain in the heart of an iconic national park in the province of Alberta, which is elsewhere attracting the world’s attention for its controversial development of its bitumen rich tar sands. The Centre is an unreal, often contradictory, space. Designed, according to its promotional material, to “Inspire Creativity,” its conceit suspends social reality, providing artists, musicians, and writers the free time to do what they want, while leaving the cooking, cleaning, and other quotidian necessities to others. To read a utopian project negatively puts the superficially hopeful questions announced by BRiC’s call—asking how we might shape new collectives, and so on—into better perspective. It allows us to see how such a hailing functions as neither blueprint nor programme nor manifesto for a better tomorrow, but rather as a recognition of the source of our current trouble. The assembly of thirty-odd cultural theorists and artists in a place like the Banff Centre is, therefore, not a model of an ideal future or a realistic site from which transformations to the existing order might be plotted. So what can be done in a place like the Banff Centre, by participants who, through their application to a program like BRiC, acknowledge that something should be done? I think the answer is twofold. Following Jameson, I would suggest the BRiC experience can be used to disclose the source of our current suffering; namely, the way neoliberalism’s twin logics of competition and efficiency have reconfigured our conception of time. Second, following Deleuze, I believe that the temporary suspension of our daily experience within that regime presents the opportunity to develop a new weapon. We should not say that one man’s hour is worth another man’s hour, but rather that one man during an hour is worth just as much as another man during an hour. “Time is everything,” Marx concludes, “man is nothing; he is at most time’s carcass.” What he means is that, in an industrial system, commodities, including labour, have no intrinsic value. Neoliberalism innovates upon this industrial logic by shifting the arbitration of time’s worth from the manager to the worker. Whereas the industrial manager expected a certain output from a certain number of man-hours, her neoliberal counterpart has no expectations at all, and indeed sees those arbitrary expectations as a regulatory impediment to maximum efficiency. Don’t tell your workers what you expect; make them understand only that they are in competition with each other for limited resources. In the context of the academic-industrial complex we need only consider the irresponsible growth of graduate programs to see how this trick is accomplished. Most of the participants in the BRiC program have a university affiliation, and though they occupy various positions in its hierarchy, all are subject to its rule of time. The regime is not suspended for the three-week duration of the BRiC program. The tenure clock ticks on; the job market is three weeks closer; the administrative emails have piled up; the postdoctoral fellowship is three weeks smaller; the supervisory committee expects evidence of progress. To do nothing at Banff or, more precisely, to do nothing useful has consequences for the individual but not the system, which continually assesses and if necessary disposes of individual carcasses based only on their current market value. The enclave of Banff may not escape the general order, but the effects of being subtracted, physically if not entirely psychically, from its rule can produce interesting results. For one thing, while it does not produce an escape from a governing regime, it at least helps someone in my position recognize better the shape and size of that regime. That is to say, while the pressure to “publish or perish” remains, understanding how that professional pressure operates in a neoliberal order allows for the development of tactical responses. Among those responses is something I would call wasting time. I do not, in saying this, imply we should become academic Bartlebys, cryptically, heroically, and fatally preferring not to engage in our grubby business. Instead, I think we might find ways to work within the given rules, finding interstices in which we might do what we want and then, after the fact, conjuring up a product that satisfies these rules. Take this essay as an example. I didn’t write it at the Banff Centre. It has nothing to do with my activities and conversations within the BRiC program. And yet, in the world outside the BRiC enclave, this essay will sufficiently account for time spent. The CV is one line longer and the granting agency that subsidized my attendance can be satisfied that their investment has produced an acceptable return. We must not complain, but rather only recognize, that the university industry has become too large, in most cases, for the administrative class to give an individual worker’s output much scrutiny. There are too many of us, too many subfields of expertise, too many scholarly journals for it to be otherwise. From one perspective this tactic looks awfully like fraud, a false accounting of the work done during an assigned time, or a betrayal of the professional scholarly ethic. Possibly, but from another, it might be called a détournement, a way of communicating not only the results of academic research in ways that are acceptable under the current system, but also of recording the conditions under which that research is being conducted. Interested readers will—all writers perpetually have hoped—still find an essay like this one, critique its scholarly merits, and come to a professional opinion on the strengths and shortcomings of its author. Administrators never will. I am only being partly facetious here. In a culture where academics at all levels are expected to function as expert time-managers, to be “always on”, we seriously need to find more ways to waste time. It is one of the few paths to genuine agency remaining to us. Bell, Nathan E. Graduate Enrollment and Degrees: 1998 to 2008. Washington, DC: Council of Graduate Schools, 2009. Print. Bourdieu, Pierre. “Utopia of Endless Exploitation: The Essence of Neoliberalism.” Le Monde Diplomatique, 1998. Web. 23 Aug. 2011. Corfield, Penelope. Power and the Professions in Britain, 1750-1850. London: Routledge, 1995. Print. Deleuze, Gilles. “Postscript on the Societies of Control,” October 59 (1992). Print. Ginsberg, Benjamin. The Fall of the Faculty: The Rise of the All-Administrative University and Why it Matters. Oxford: Oxford University Press, 2011. Print. Harvey, David. A Brief History of Neoliberlaism. Oxford: Oxford UP, 2005. Print. Jameson, Fredric. Archaeologies of the Future. London: Verso, 2005. Print. National Center for Education Statistics. “Fast Facts.” Web. 23 Aug. 2011. Perkin, Harold. The Rise of Professional Society: England Since 1880. London: Routledge, 1989. Print. Proudhoun, Pierre-Joseph. System of Economical Contradictions; or, The Philosophy of Misery. New York: Arno Press, 1972. Print. Schopenhauer, Arthur. “On Thinking for One’s Self” in The Art of Literature, Trans. T. Bailey Saunders. London: Swan Sonnenschein, 1891. Print. Szeman, Imre and Heather Zwicker. “Banff Research in Culture 1: May 8-28, 2011.” Web. 23 Aug. 2011. “Fast Facts,” National Center for Education Statistics, accessed 23 August 2011, http://nces.ed.gov/fastfacts/display.asp?id=98/. Of course, as with any ideology, stated ideals often obscure material practice. In the case of neoliberalism, the financial crisis of 2008-09 reveals how necessary the state becomes at the moment of economic crisis, providing credit, loan guarantees, and bailouts to unstable corporations. For more on the distinction between neoliberal theory and practice, see David Harvey’s A Brief History of Neoliberlaism (Oxford: Oxford UP, 2005), 16-19. Imre Szeman and Heather Zwicker, “Banff Research in Culture 1: May 8-28, 2011”, accessed 23 August 2011, http://www.crcculturalstudies.ca/research/banff-summer-school-for-research-in-culture/. Since I am using the BRiC experience to illuminate certain conditions of working in the university system, my analysis is restricted to those (the vast majority) who, when not at BRiC, have a university affiliation. The artists and curators in attendance doubtless would have important things to add to this conversation. Karl Marx, The Poverty of Philosophy, (Progress Publishers, 1955), accessed 23 August 2011, http://www.marxists.org/archive/marx/works/1847/poverty-philosophy/.